In My Trips you can add collaborators to any trip you're planning. 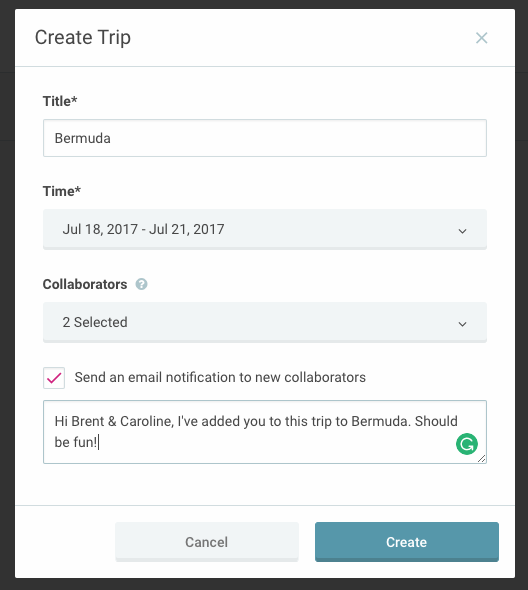 EverTrue users listed as trip collaborators have all of the permissions of the original trip owner, including editing trip details and meetings, adding additional collaborators, and deleting the trip. Use Case: When planning a trip with a co-worker, you may want to give them access to edit the trip details and meetings so that you can collaborate independently. Or if you're planning a trip for a gift officer you support, it may be helpful to have permissions to edit the entire trip on their behalf. When creating a new trip, you can add collaborators right away. Enter the title and time of your trip, then add the collaborators before you save. You will have the option to send them an email notification about the trip and include a friendly message. If you're already in the process of crafting a trip, you can add collaborators at any time. From within your trip, click the people icon in the upper-right corner. This is where you can add other EverTrue users as collaborators. Once added as a collaborator, they will see the trip in their My Trips section of EverTrue and have any of those trip meetings in their calendar feed. Collaborators will be shown near the top of your trip. Hover over each user's picture to display their permissions. Any trip created in EverTrue can be viewed by other users. On your My Trips home page, click on your name in the upper-left corner to reveal a drop down menu of all users. Select any user to see both their upcoming and past trips. When browsing another user's trips, you are in view-only mode and cannot make edits unless you are added as a collaborator. As a viewer, you are unable to add yourself as a collaborator. A trip Collaborator can edit trip details and add/edit meetings. A Trip Collaborator can add additional collaborators. A Trip Collaborator can delete a trip. A Trip Collaborator can remove themselves from a trip, after which the trip will be removed from their “My Trips” view. A Trip Collaborator cannot remove the Trip Owner as a collaborator. A Trip Owner cannot remove themselves as a collaborator. To remove a collaborator from a trip, click the collaborator (people) icon in the upper-right corner. 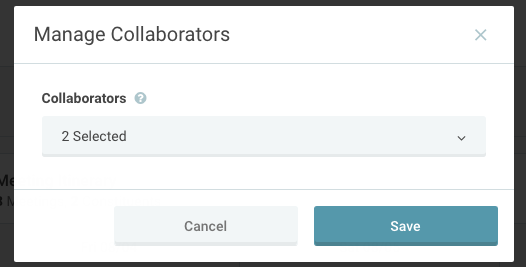 A "Manage Collaborators" pop-up will appear where you can deselect any current collaborators. Once they are unchecked, hit save and they will be removed.